I haven’t actually touched the new iPad Pro’s keyboard, but I have used the big iPad Pro’s enough to know that it feels weird and is louder than galloping horses when typing. Chances are good it’s the same keyboard. While it’s likely just as serviceable as the Galaxy TabPro S’s keyboard, both lose handily to the Surface Pro 4. It’s really too bad that the Galaxy TabPro S’s keyboard wasn’t more of a contender. It looks like a clone of the Surface Pro 3’s keyboard, but all of the keys have a rattling, loose feel to them. The only thing I’d give the Galaxy TabPro S’s keyboard over Apple’s unsatisfying option is the former’s ability to hold the screen at an adjusted, lower angle. The iPad Pro has just one orientation. Of the three contenders, I’ve only used the Surface Pro 4 and the big iPad Pro in stylus mode. The new 9.7-inch iPad Pro uses the same pen technology found in the larger model. Pen computing was a long time coming on the iPad, but Apple’s implementation is pretty awesome and most people, including artists, simply love it. Microsoft’s N-trig pen on the Surface Pro 4 is well-liked, too, but most users give Apple’s pen the edge. Go with what works best for you. If you’re like me and just need to sign an NDA electronically or jot a few notes, there’s really no difference. Samsung’s Galaxy TabPro S has pen support but the pen isn’t yet available to test, so it loses by default. Winner: Beyond my capability to say, and if you saw my handwriting, you’d understand. Form factor and weight can’t be ignored. While I think the Surface line-up has a pretty big advantage over the competition with its kickstand and adjustable viewing angles, there are just some things the Surface doesn’t do well—like laps. 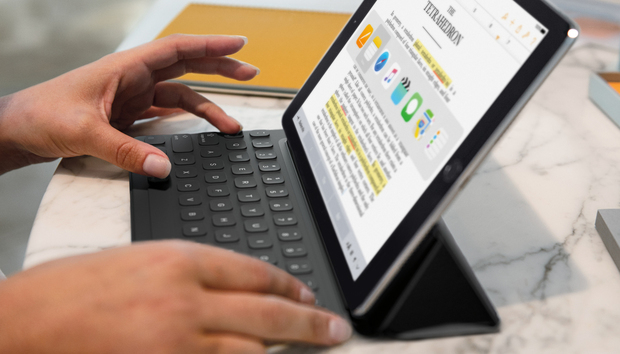 Despite its funky keyboard, the iPad Pro does OK on a lap. As does the Samsung Galaxy TabPro S. That’s because those clumsy keyboard covers offer more surface area to sit on your lap. The Surface requires more space to set up, and unless you play for the NBA, your legs won’t be long enough. With that said, none of them are great. Type with any energy on either the iPad Pro or Galaxy TabPro S while its on your lap, and it feels like the tablet might simply detach and flip off. The big advantage for Apple with the new iPad Pro is its weight. The company specs it at just under one pound. Apple doesn’t list the weight of the keyboard, but if it’s like the big iPad Pro’s keyboard, it’ll be about 9 or 10 ounces. That makes the entire package maybe one pound and 10 ounces. That’s even lighter than the slow Microsoft Surface 3, which already feels like nothing. Again, I’m still not sold on “real” desktop productivity on an iPad Pro, but at that weight, it might well be worth taking a performance hit. Both the new Samsung Galaxy TabPro S and 12.9-inch iPad Pro feature keyboard covers that double as kickstands. They are both a little cumbersome and don’t offer the adjustable angles of the Surface-series. Apple uses a high-performance 12MP camera in the iPad Pro that can shoot 4K UltraHD video. Compared to the Galaxy TabPro S and Surface Pro 4 cameras, it’s likely to take the best pictures and video, but is this really a good thing? Do you want to be that person at an event blocking everyone’s view with your 10-inch tablet? Just don’t, OK? Winner: iPad Pro, but really no one wins. The camera in the new small iPad Pro may be great, but please don’t be this guy, OK? Yes, yes, you do X in Y all day on your big iPad Pro. Whatever. iOS might be “the perfect expression of the future of computing,” but today, when I want to run multiple desktop apps with fine-grain control and a precision trackpad, I’ll take a desktop-focused OS such as Windows 10 or OS X over iOS. Period. We just need to agree that a desktop OS is better for productivity applications right now. Between the two Windows machines, though, I’d have to pick the Surface Pro 4 over the Galaxy TabPro S. The Surface Pro 4 has a better keyboard, variable screen angles, and the ability to plug in standard USB Type A and Mini DisplayPort without needing to break out a dongle. OK, let’s see, now where’s the trackpad again? The Surface Pro 4 doesn’t take all the categories, but I’m going to crown it the overall winner here. If your aim is to get the best productivity tablet or 2-in-1, Microsoft’s Surface Pro 4 is the undisputed winner.